Especially the fact that you can connect to an existing project by inserting the project ID as title is not obvious and undocumented. 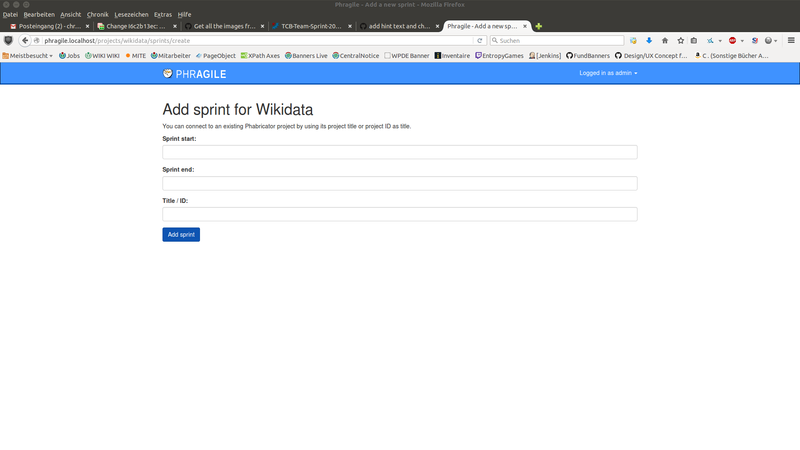 Tobi_WMDE_SW added projects: Phragile, Phragile-1.1-release. Tobi_WMDE_SW moved this task to Incoming on the Phragile board. Tobi_WMDE_SW added subscribers: Tobi_WMDE_SW, • ksmith, Jakob_WMDE. WMDE-Fisch added a project: TCB-Team-Sprint-2016-01-13. WMDE-Fisch edited a custom field. WMDE-Fisch moved this task from Backlog to Doing on the TCB-Team-Sprint-2016-01-13 board. Apart from adding a sentence explaining that existing Phabricator projects can be connected, I would like to change the title and the links form New sprint/Create sprint to Add sprint. @WMDE-Fisch I think if someone provides a title that does not exist on Phabricator yet, a new project on Phabricator is created.. We should describe this behavior as well. WMDE-Fisch moved this task from Proposed to Review on the TCB-Team-Sprint-2016-01-27 board.